^ Lavery, Ships of the Line, vol. 1, p. 175. ^ English/British Naval History to 1815: A Guide to the Literature. 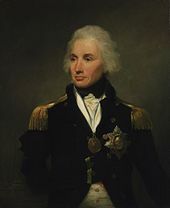 p. 129. https://books.google.com/books?id=D4oNNsTdvEoC&pg=PA129&dq=HMS+Victory+mirabilis&hl=en&sa=X&ei=ZiZfVYXaHYevsAWMmoGQDA&ved=0CDQQ6AEwBA#v=onepage&q=HMS%20Victory%20mirabilis&f=false. ^ Gossett (1986), pp. 23-4. ^ Warwick. Voices from the Battle of Trafalgar. pp. 200–1. Best, Nicholas (2005). Trafalgar – The Untold Story of the Greatest Sea Battle in History. London: The Orion Publishing Group Ltd. ISBN 0-297-84622-1. Christopher, John (2010). 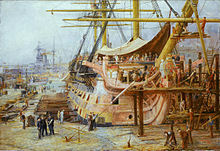 The HMS Victory Story. Stroud: The History Press. ISBN 978-0-7524-5605-8. Dull, Jonathan R. (2009). The Age of the Ship of the Line. Barnsley: Seaforth Publishing. ISBN 978-1-84832-549-4. Eastland, Jonathan; Ballantyne, Iain (2011). 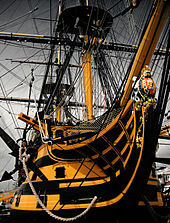 HMS Victory – First Rate 1765. Barnsley: Seaforth Publishing, Pen and Sword Books. ISBN 978-1-84832-094-9. Lavery, Brian (2003) The Ship of the Line Volume 1: The development of the battlefleet 1650–1850. Conway Maritime Press. ISBN 0-85177-252-8. Longridge, Charles. N. The Anatomy of Nelson's Ships. Naval Institute Press. ISBN 0-87021-077-7. MacDougall, Philip (1987). The Chatham Dockyard Story. Meresborough Books. ISBN 0-948193-30-1. McKay, John (2000). The 100-Gun Ship Victory. Anova Books Ltd.. ISBN 978-1-84486-223-8. Stilwell, Alexander (2005). The Trafalgar Companion. Oxford: Osprey Publishing. ISBN 1-84176-835-9. Vincent, Edgar (2003). Nelson: Love & Fame. London: Yale University Press. ISBN 0-300-10260-7. Warwick, Peter. 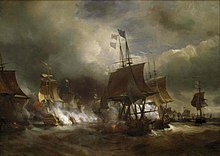 Voices from the Battle of Trafalgar. David & Charles. ISBN 0-7153-2000-9. Willis, Sam (2013). 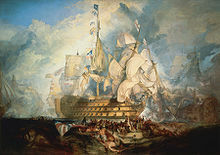 In the Hour of Victory – The Royal Navy at War in the Age of Nelson. London: Atlantic Books Ltd. ISBN 978-0-85789-570-7. Wilson, Ben (2013). Empire of the Deep. London: Weidenfeld & Nicolson. ISBN 978-0-297-86408-0. Winfield, Rif (2007) British Warships in the Age of Sail 1714–1792: Design, Construction, Careers and Fates. Seaforth Publishing. ISBN 978-1-84415-700-6. Winfield, Rif (2005) British Warships in the Age of Sail 1793–1817: Design, Construction, Careers and Fates. Seaforth Publishing. ISBN 978-1-84415-717-4.